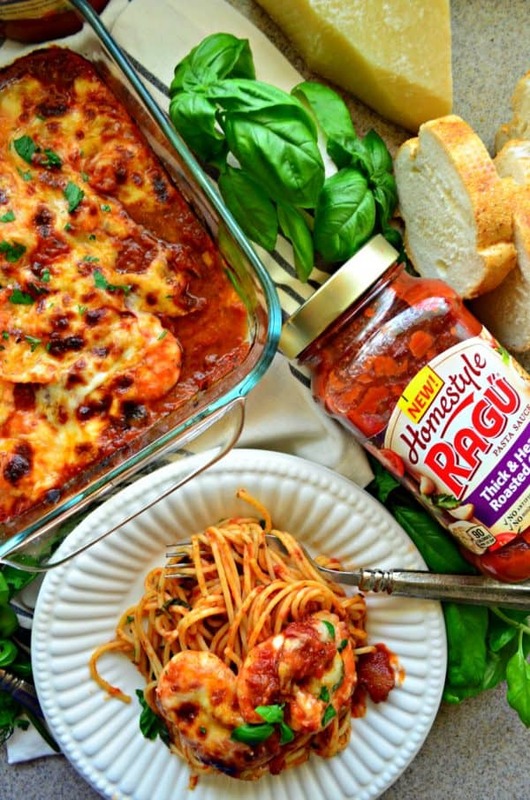 Make my lightened up Shrimp Parmesan Pasta for dinner tonight using Ragu Homestyle pasta sauce, spaghetti and fresh shrimp! 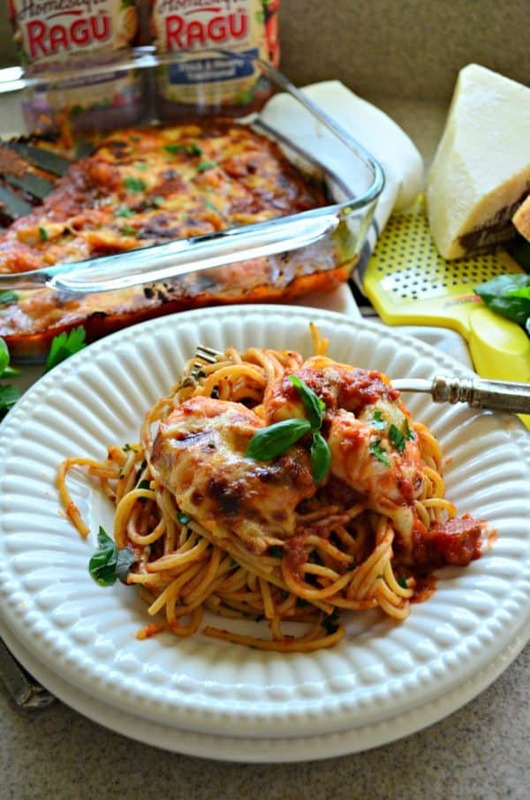 My mother in-law has been making this recipe for Baked Shrimp Parmesan with Pasta for years. When I’m not in the mood to cook, but know that going out to eat is not an option this is one of my Ragu pasta sauce to cook. The entire dinner is done in 30 minutes! We call this shrimp Parmesan although, the shrimp are not battered or fried. They are just cooked in spaghetti sauce in the oven with a lot of cheese, and then topped on a plate of pasta. My husband grew up with Ragu pasta sauce and the tradition has continued in our home. It’s been his mom’s go-to sauce for years. When you open up her pantry she always has at least 4 jars on hand at all times. I was excited to share with her the new Ragu “Homestyle Thick and Hearty” sauce family. The sauces include: Homestyle Thick and Hearty Traditional Sauce, Homestyle Thick and Hearty Meat Sauce, Homestyle Thick and Hearty Four Cheese Sauce, Homestyle Thick and Hearty Roasted Garlic Sauce, Homestyle Thick and Hearty Mushroom Sauce. You can find them exclusively at Super Target and some Super WalMarts! So let’s talk about how easy this dinner is. The entire meal is made in under 30 minutes! If you like shrimp, red sauce, and pasta you’ll want to bookmark (or pin) this recipe for a later date. And then make this when your not in the mood to cook. I promise it will change your mood! You only need 1 jar of sauce for 4 servings. I use half the jar in the bottom of a baking dish. 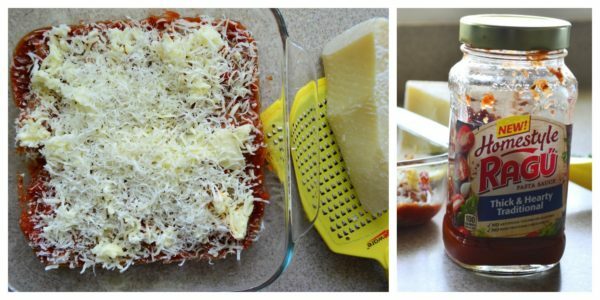 Layer the shrimp in the dish, spoon a little sauce on top and then cover with lots of shredded mozzarella cheese and Parmesan cheese. In the oven it goes for about 15 minutes. You’ll want to cook the pasta while the shrimp bake. After the baked shrimp Parmesan bakes for 15-ish minutes and the cheese is golden in color it’s time to take it out of the oven! I like to sprinkle the bake with a little fresh parsley! Let the dish rest for a few minutes. Drain the pasta if you haven’t done so already. Then, mix in the rest of the Ragu Homestyle sauce with the pasta. I always add fresh herbs to my pasta if I have it on hand, add the herbs, mix well, then plate. Then, take a spatula and begin to scoop out the ooey gooey cheesy shrimp Parmesan onto the piles of pasta on the plates. I like to serve this meal with steamed broccoli, a salad, and buttered Italian bread. 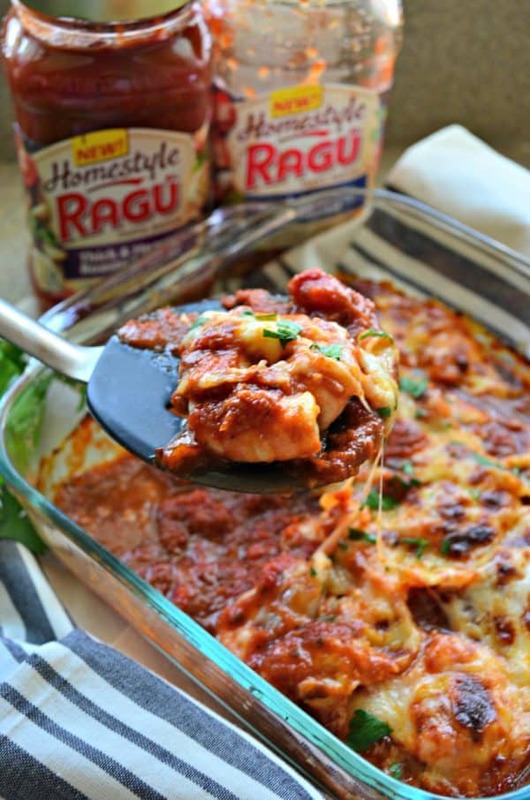 My recipe for Baked Shrimp Parmesan with Pasta is one of my Ragu Homestyle sauce to make on a busy weeknights when I just need to get dinner on the table, and fast! I’m so glad I’m finally sharing this recipe. I swear this is the year of sharing all my go-to fast meals that I’ve been keeping from my readers for over the past 7 years! 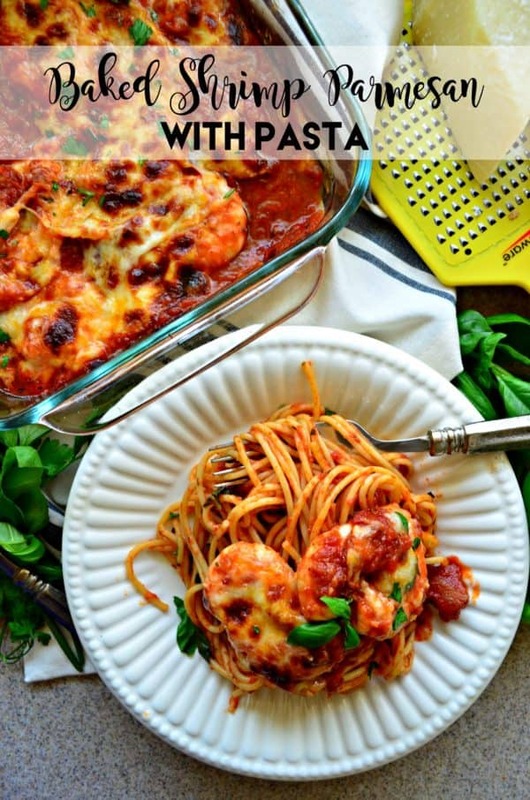 Sometimes simple is always better and that is definitely the case with my recipe for Baked Shrimp Parmesan with Pasta! 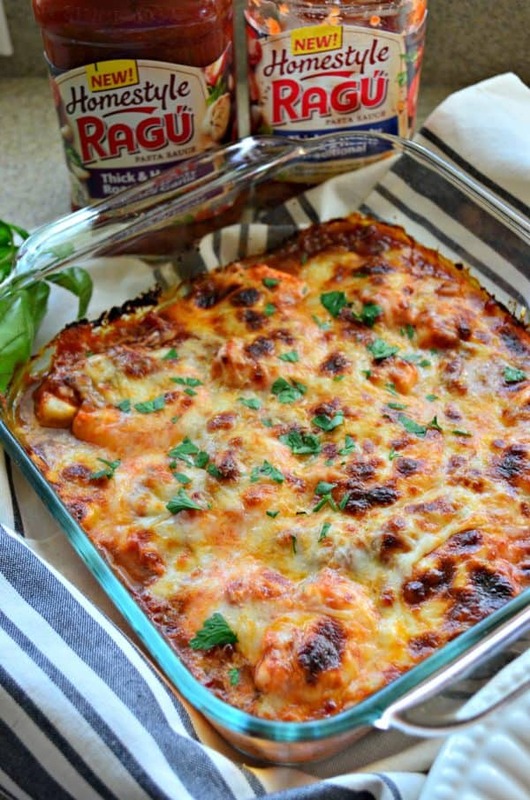 While oven preheats and water boils, add half the jar of Homestyle Ragu Pasta Sauce to an 8x8 baking dish. Then, pat dry the peeled and deveined shrimp and add to the sauce laying flat and try not to overlap. Spoon a little bit of sauce on each individual shrimp. Then, sprinkle the shredded mozzarella cheese and Parmesan cheese on top of each piece of shrimp. Place the shrimp in the oven and cook for 10 minutes. Then, place the spaghetti in the pot and cook for 10 minutes as well. Drain the pasta. Add the additional half jar of sauce back to the pasta pot. Place the spaghetti in the pot as well as fresh basil and parsley, and mix well so that the sauce hugs every last noodle. After the shrimp cooks for 10 minutes increase the heat to 500 degree's and broil for 5 minutes or until cheese is golden brown but not burnt (keep an eye on the cheese, minute-by-minute). Divide the pasta among four plates. Then add 5 jumbo shrimp on top of each piece of pasta. Top with additional Parmesan cheese, fresh basil, and parsley. Enjoy immediately.